Suleiman the Magnificent returns to lead the Ottoman Empire in Civilization VI’s coming Gathering Storm expansion, and under his leadership, the Ottomans look set to be one of the strongest military civs in the game. The Ottomans’ unique ability, Great Turkish Bombard, grants an astonishing +50% production toward all siege units, and gives them +5 combat strength against district defences. As if that weren’t enough – it kinda is – cities you conquer won’t lose population, and will even get amenity and loyalty bonuses while under Ottoman control. The Ottoman unique building, Grand Bazaar, replaces the bank in the Commercial Hub district. It grants amenities, but more importantly it’ll give you more of whatever strategic resources that city is producing. The Barbary Corsair is the Ottomans’ unique unit. It replaces the Privateer but can be built earlier, can make coastal raids without spending movement points, and – like submarines – is invisible unless the enemy is adjacent to it. Suleiman grants a second unique unit in the Janissary – a Musketman replacement that is stronger, cheaper, and starts with a free promotion. On the downside, Janissaries will consume a population unit, unless trained in a conquered city. 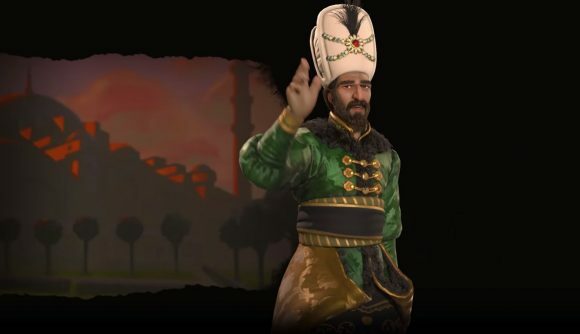 Besides granting Janissaries, Suleiman also has a leader ability named Grand Vizier. This unlocks a unique governor named Ibrahim who can be established in rival civs, where he can increase Alliance leveling rates, reduce grievances, and even completely nullify all loyalty pressure exerted by all their cities. The Ottomans look like a really strong military civ, especially in the first half of the game. Siege units are near-indispensible in early conquests since cities are tough to crack without them, yet they’re expensive when first developed. Halving that expense is an amazing boost in the Classical era, but remains relevant throughout the game, since Artillery and Rocket Artillery are already among its deadliest units. Add this to the extra strategic resources of the Grand Bazaar, and Suleiman can probably field more resource-dependent units than anyone (unless you get very unlucky from RNG). The fact that conquered cities suffer far fewer penalties from getting conquered than anyone else, and can churn out the awesome-looking Janissary, is just another violent cherry on the warmongery cake. Civ 6: Gathering Storm is out on February 14.